At the May 2, Val Gleason - from Newton Medical Center talked about healthcare - the ACA - and other issues that are relevant in the healthcare industry. Val has worked in healthcare since 1975, which to her seems like yesterday! Her clinical background was spent in adult Intensive Care Units: Coronary Care, Burn, Transplant, and Surgical ICUs. 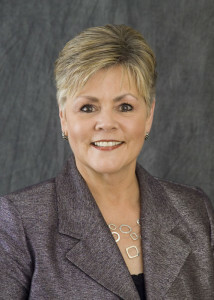 She started a progressive managerial track in 1989 and in 2002, accepted her first executive position at the former Riverside Health System in Wichita. For the past 15 years, she has worked in the area of hospital administration focusing on the areas of clinical care, medical staff organization, risk and quality management, and multi-disciplinary clinic development. Figuring out how the hospital can do its very best to improve the community’s overall health. Most of all, she respects and appreciates the wonderful staff at the hospital – the hospital employees, the clinic employees and the Medical Staff. NMC is truly blessed with a deep reservoir of talent throughout the organization. She says that every day spent working in the presence of such talent is humbling and deeply gratifying – and it gives her a great reason to come to work each day. She is an adjunct faculty member at Friends University in the Master of Healthcare Leadership curriculum. She is a current member of the Policy and Advocacy Committee and the Governance Committee for the Kansas Hospital Association. She also serves on the Board of Asbury Park.